The Roman Catholic Church’s Cathedral of the Immaculate Conception. The Roman Catholic Church in Guyana has called on President David Granger and Opposition Leader, Bharrat Jagdeo to meet urgently to map a plan of action aimed at healing the nation. 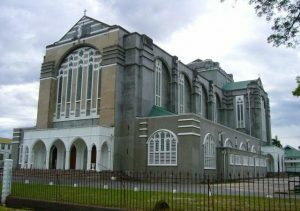 The Roman Catholic Church said the onus is squarely on the shoulders of Guyana’s political leaders to address this situation comprehensively aimed at achieving peaceful coexistence. “JPC calls on the President and Leader of the Opposition to engage each other and agree on a programme of healing that will relieve the nation of its pain and lead us to the promised land of trust in each other. JPC believes this programme of healing must include constitutional and political party reform, and improved social cohesion and ethnic relations,” the JPC said in a statement. Granger and Jagdeo have publicly stated in recent weeks that they are willing to meet with each other to help move Guyana forward, but so far there is no word whether the two have formally indicated such a desire in writing or by telephone. The RC Church’s societal watchdog listed several issues that have caused concern. They are the Hamilton Green Pension Bill 2016, the Durban Park accountability scandal, the controversial rental of a pharmaceutical “bond”, audit reports, including on Pradoville 2 and other allegations of the misuse of state resources for partisan and/or personal gain, massive salary increases for ministers and others, “Baishanlin-gate”, the melting down of Guysuco and the manner in which the Rodney Commission was initiated and concluded. The JPC urged all People of Faith to pray for Guyana and its leaders and refrain from participating in divisive acts. “We further urge that citizens, as voters and children of God, refuse to participate in political efforts to further divide us and hold political leaders more accountable for their performance on our behalf,” the Roman Catholic Church organisation said. Also of grave concern to the Roman Catholic Church is the tone of parliamentary debates, calling the behaviour of lawmakers “undignified and unproductive” in conducting the people’s business. “While Parliamentarians are obliged to listen and represent the views of their constituents, the inability to reconcile differences across the aisle serves to further alienate and frustrate the People,” the JPC added. In 2014, the JPC undertook research into Guyanese Catholic views on justice and peace in Guyana, views the Church believes are shared by Guyanese at large. Key among those views, released in November 2015, is that Guyana suffers increased levels of injustice and violence as a result of our inability to reconcile from earlier pain, inclusive of political and social pain. An obvious symptom of our brokenness is a reduced level of socio-political trust.